Pet Grooming is essential, not only to keep them happy and fresh but also to keep your home germs free. Bathing your pets regularly is an enjoyable task. Some pets hate water, while others take it as fun. As a pet owner, it is your duty to keep them happy, look after their small to big needs. It is also important to engage them in grooming sessions so that they can live a healthy lifestyle with you. Children’s simply adore pets like the dog, they love to toddle them and everyone knows how loyal a dog is to their owner. Bathing Your Dog : As humans, we bath ourselves to remove all the germs and dirt from the body. Similarly, a pet like a dog (the favourite of maximum pet lovers), cat, or some other you must regularly bath them. Remember not to wash their body only with water but using proper shampoo or pet grooming products. 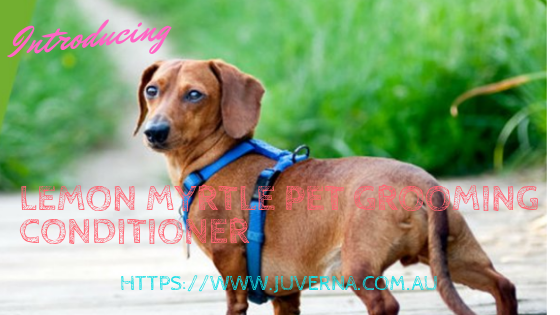 Use Conditioner After A Bath : Apply a hypoallergenic conditioner like the Lemon Myrtle Pet Grooming Conditioner to keep their fur soft and smooth. Lemon Myrtle is a herb of the Australian Origin and is known for its medicinal, antibacterial and antifungal properties. Therefore, when the conditioner is used upon your pets after a bath, gives them germ protection. Conditioning also helps in replenishing the coat, leaving it healthy and clean with a unique nature-inspired scent. Such pet conditioners are free from dyes or chemical. Hence, follow these steps to maintain the ph balance, improving coat as well as protecting their delicate skin. Nail Grooming : The nails of pets must be trimmed regularly as sharp nails can be harmful to the family members. The ears should be cleaned once in a week to remove excess ear wax. Use a soft cloth or cotton balls in doing so. Apply proper pet toothpaste for their teeth, brush and rinse off. If you do not find the proper time to care for your pets surely find a professional for care. Proper Food and care : Besides using products like the shampoo,Pet Grooming Conditioner, brushes and others, you must also care for your’s pet’s internal health. Feed your dog quality food and supplements. This will ensure that they have a natural and shiny coat. Use The Right Brush According To The Breed : Once you have got your pet bathed do brush their fur. Experts recommend brushing the dog three times a week. Different dogs breed has varied levels of fur thickness. Brushing can be done before or after bathing. Moreover, regular grooming prevents and removes matted hair. It also reduces shedding and you get the opportunity to detect lumps in their body.